Indie game developer, freelancer, Dutchman. A clear schedule this weekend, a good shortlist of themes, what more could I ask for? Worse weather, perhaps. Or my laptop back from the repair shop so I can work out in the sun. This is the second part of this postmortem. Catch up on the first part here. The throw animation is similar to the bucket-passing animation: simply move the bucket in the direction of the destination tile. However, it moves a lot faster to make it look like it's being thrown. Also, the bucket is rotated in the direction of movement. When the bucket reaches the edge of the tile, the peep destroys it and emits a throwing signal that the level_base.gd script listens for. Upon receiving this signal, a water animation sprite is added to the objects node, and the fire in the tile (if any) has its size reduced by 1. I also changed the control scheme slightly, to allow the player to arbitrarily change the direction in which peeps pass buckets. This meant that changes are no longer triggered by dragging on a tile, but by dragging from one tile to the next. At the moment the mouse cursor crosses the border between two tiles, the destination of the source tile is set to the target tile, and peeps are summoned as described before. This allows for any change in bucket routing. Unfortunately, it doesn't allow the player to liberate peeps for deploying them elsewhere. Clicking or dragging with the right mouse button might have been a logical gesture for this, but I wanted this to be workable on mobile devices as well, so I went with the slightly unintuitive "drag from unmanned cells into manned cells" instead. It's not great, but it works well once you understand it. A house with light behind its windows contains one peep. As soon as the house catches fire, the peep runs outside and is available for the player to deploy in fighting said fire. This works well, because it gives me a way to control difficulty by balancing the number of occupied and unoccupied houses. (I didn't do much of such balancing, so in the later levels, all houses are occupied.) Also, the new peep is spawned close to the location where it's likely to be needed, leading to a minimum of player frustration. By "chrome" I mean all the window dressing that isn't part of the game proper, but is needed anyway. Things like menus, intros, game-over screens, level switchers and a HUD. The first step was to detect when all fires were put out, and throw up a win screen. By counting how much of the houses were still standing, I could even assign a score. High scores are being kept in a simple INI-like file, read and written by Godot's built-in ConfigFile class. On the win screen, I put a "next level" button, so I had to make sure there actually was a next level. While I was at it, I also put level switching buttons on the main game screen. I didn't bother locking future levels, because any level can be completed (albeit with a terrible score) just by waiting for the entire city to burn down. I also added a pause button. I don't usually bother with this during game jams, but in this case, I saw it as a core gameplay feature. It gives the player a chance to catch their breath, and give new instructions to their peeps at leisure. Adding pause functionality was a learning opportunity for me, but Godot's built-in pause functionality turned out to be exactly what I needed. You can simply tell the entire scene tree to pause and unpause. Each individual node can be configured to be processed or not while the tree is paused, so fire stops spreading and your peeps stop moving, but the GUI continues to be responsive. This was also when the intro text was added. Godot's built-in AnimationPlayer is absolutely wonderful for making and tweaking these sorts of transitions. Any property can be animated, including user-defined ones. Animations can call functions on cue. And all this is going to get even better in the 3.1 release. This was in the category of "good enough for now, maybe polish later". I should have done sound effects first, but I'm always a bit hesitant because I'm inexperienced with them (and hate Audacity), so I wanted to improve the way the peeps look and feel. It's worth noting that all these sprites are still 16×16 pixels, so I can just put them directly on top of each other without having to bother with positioning and alignment. Implementing all these sprites in the game was easy, because peep.tscn was already its own scene, decoupled from the rest of the code. So I could just add a body and head sprite node, as well as a set_direction function to point the peep left, right, up or down. A slight difficulty arose with the orientation of peeps passing buckets: I wanted them to pass buckets from side to side (left to right), but didn't want them to stand with their back to the player and obscure the water buckets. My current solution for this isn't perfect, and will sometimes cause peeps to stand clumsily with their back to the peep who's passing them a bucket. But it's good enough. I also added an offset so that peeps would stand back slightly, and pass buckets in front of them rather than through the middle of their sprite. Panicking peeps wave their hands in the air with opposite phase: both hands go inwards and outwards at the same time. Cheering peeps (when you have won) do similar, but in phase: their hands go left and right at the same time. Peeps heading to their post, or waiting for a bucket, have their hands at their sides. Peeps holding a bucket have their hands positioned slightly above the bucket. All this is rather hacky, last-minute code, but we were nearing the last minute, so this was entirely allowed. Fun fact: to hide the right hand when the peep is facing left and vice versa, I don't call hide(), because that would mean I have to remember to call show() again later on. Instead, I simply set its position to 99999, 99999 so the hand is drawn offscreen. This system is probably broken in a fair number of ways, but as long as the player does as they're told, they won't notice. And if they do differently, they probably already know how to play anyway. Less than two hours to go until the deadline, and the game was still completely silent. I let a mute game happen to me last time, but not again! Unfortunately I lack even a basic standalone microphone, so I used the mic in my webcam to record everything. The fun part was, of course, the yelling voices. Six variants of "aaah" for panicking peeps (three of which contributed by my girlfriend, but I didn't deem this enough of a contribution to switch to the "team" category), and several "fire! "s for peeps being driven out of their house by the fire. I used the Equalize filter in Audacity to cut the bass tones, which gives these sounds a more "outdoors" quality. In the Godot engine, I randomly changed the pitch plus or minus 20% to get some extra variety. The alarm bell sound was made by hitting a steel pot lid with a wooden spoon. It was difficult to make this loud enough while preventing clipping. I tried with a Compressor filter, but that didn't help much. But the perfect is the enemy of the good enough, so I moved on. The splashing sound was just me making funny noises, with the pitch shifted down to more closely resemble a bucket full of water rather than a mouth full of tongue and saliva (you're welcome). The hissing sound that you get when water hits fire (actually, come to think of it, also when hitting a non-burning house…) involved actual fire to make. I heated up an empty pan on the stove, carried it over to the webcam on my desk, and poured cold water into it to make it sizzle. It didn't sound nearly the way I had imagined, but with some more pitch shifting I think it turned out quite well. The crackling sound that the fire makes is just me crumpling up a page from a newspaper. In context, it's surprisingly effective. To make it loop, I didn't even bother to do any kind of crossfade; it turned out that the loop point in a sound full of clicks, pops and crackle is undetectable anyway. In the engine, this sound is continuously looped, but its volume is changed based on how much fire there is on the screen. Finally, two of the sounds were created entirely inside the computer. The "ta-daa" sound you hear when you win a level was made in LMMS. It's just a C major chord played over two octaves on a brass-like synthesizer instrument. For the music that plays during the intro, I was orinigally looking for a moody droning instrument. But while browsing the LMMS instrument library, I found this deep bell sound that seemed fitting. I started experimenting with simple melodies, and soon it clicked: it had to play the Westminster Quarters. This is the melody played every hour, on the hour, by Big Ben in London. Admittedly, the tune hadn't been written yet in 1666, but I'll allow for this anachronism for the sake of awesomeness. This has turned into a pretty long read, but I hope it's given you an idea of what went into making The Great Fire. And maybe you even learned something. I certainly did! This article was cross-posted from my blog. I was really happy about the shortlist of potential themes, so I knew this was going to be a fun one. The winning theme, "Always growing", was my second choice. In this article, I'll describe beat by beat how my entry, The Great Fire, came to be. It will get a bit technical in places; Godot users might be interested in reading along in the source code. I might even throw in some tips for beginning game jammers. As you can probably tell, I was still leaning towards a plant-based theme at that point. This all changed while I was mulling things over in bed, and I went to sleep with a fairly well defined picture in my head of how I wanted the game to be. I'm definitely a "planner" in this respect. I may not write up my plans in great detail, but I need to have a clear objective in mind and a reasonably clear path of how to get there. And the great thing about working solo is that I don't have to waste time communicating this vision with anyone else, or – eek – reaching some kind of agreement about what we're going to do. So in this case, the control scheme (drag to create and change a route), graphics style (pixel art), AI (peep behaviour) was all thought out in advance. Even the resolution was decided on: 480×270 (a 16:9 ratio, useful for a possible mobile port later) with 16×16 pixel tiles, for a grid of 30×15 tiles plus a 30-pixel top bar. That would give me enough room for sufficiently large cities, without having to build controls for scrolling the map. Having outlined the plan in my mind, I kicked off Saturday morning by writing down a to-do list. Very little was added to that list during the jam, and all must-have items were crossed off, which shows that I got the planning part very much right this time! I had already decided to use the Godot engine again, so I set up an empty project and created a Git repository for it. Always use version control, folks! The transparent blue arrow evolved into the smaller, visually less cluttered chevrons that you see in the final game. The fire sprites have 5 stages, each consisting of two animation frames. These frames are just mirror images of each other. I could have mirrored them in-engine, but by doing it in Gimp, the path to a fancier animation remained simple. The brown arrow was meant to indicate a wind direction. I failed to write "wind" on the to-do list though, and almost forgot about it altogether, so this remained unimplemented. I had some more ideas on the "nice to have" list that might require additional sprites, but this set was enough to get me started with coding. I later replaced this feature by a second tile map, named init, where I could place peeps and fire manually. This map is be processed into actual nodes at startup, and then disposed of. get(coord) returns some predefined default value if the coordinates are out of bounds. Saves a lot of bounds checking code everywhere. neighbors(coord) (I use American spelling in code, sue me) returns an array of neighbouring coordinates to the left, right, top and bottom of the given coordinate pair. Very useful for many things, including pathfinding and fire spreading. get_cell_center(coord) to convert from grid cell coordinates to pixel locations. It's not very clean to put this here, but it is very convenient, because the grid gets passed around to many places where this information is needed. is_walkable: a flag for the pathfinding algorithm. is_water: whether we can draw buckets of water from this tile. peeps: an array of peeps that are currently in this tile. destination: coordinates of a neighbouring cell that buckets should be passed or thrown towards. At the start of each level, the tile map is parsed, and these cells are created based on the names of the tiles. (Consistent naming for your tile sprites helps here.) At this point we create some peeps and add them to the objects node. Each peep is a scene, aptly named peep.tscn, with a script peep.gd attached to its root node. Inside that script is where the magic happens. A panicking peep will run around in the streets randomly. But I didn't want a "pure" random walk, because it leads to a lot of back-and-forth movement. 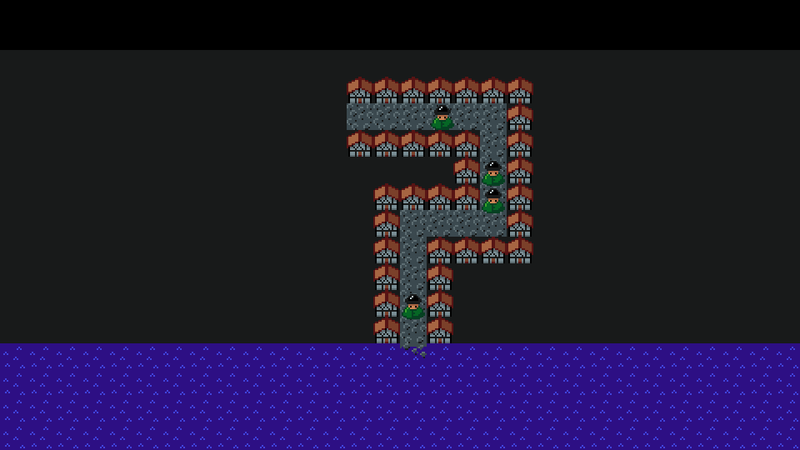 Instead, I implemented a kind of randomized pathfinding. We generate a route of 4 to 8 tiles long, from the current location, taking care not to visit any previous node on that route. This route is stored as a queue of tile coordinates (Vector2 type). The _physics_process function simply moves the peep towards the next point in the route, and pops the point off the queue once it's reached. This sort of algorithm sounds complex, but I've done such things so many times that I can often write them correctly with my eyes closed. Next up: passing buckets of water around. Once a peep reaches its designated cell, it switches to the PASSING state. While in the PASSING state, it passes any bucket it holds on in the direction that its cell's destination indicates. If it holds no bucket, it looks for a neighbouring water tile and creates a new bucket from it. The buckets are actually child nodes of the peeps themselves, so they are being reparented each time they change hands. I suspect it might have been slightly easier to make them sibling nodes of the peeps instead. As the final thing on Saturday evening, I implemented fire. Fire nodes are also added to the objects node in the level, and a reference to the fire node is also stored in the cell for quick lookup. Spreading of fire works as follows. Each fire has a size of 1 through 5, corresponding to the sprites you saw earlier. Every 3 seconds (plus or minus 30% randomly), the fire "grows". This doesn't mean that its size increases by 1, though. Instead, for each size, we have a predefined "growth radius". A random tile is selected within that radius, and if that tile is flammable, the fire on that tile is started or embiggened. At sizes 1 and 2, this radius is 0, so the only candidate tile inside the radius is the fire itself. So up to size 3, a fire cannot spread, only grow locally. At sizes 3 and 4, the radius is 1, so the fire has a 20% chance of spreading to each of four neighbouring tiles and a 20% chance of growing itself. And at size 5, the radius is 2 and the fire can jump across the street — as a player, these are the fires you really want to watch out for! Also at size 5, the fire has a 50% chance of causing collapse of its building (and itself). This prevents fires from spreading too rapidly. Allowing such collapses to happen also gives the player a dangerous, but effective way of creating fire breaks. That's how far I got on Saturday, with still lots of work ahead of me on Sunday. But this is turning into a pretty long article, so I'm going to break it up into two halves. The second half is going live here on Wednesday. Stay tuned! 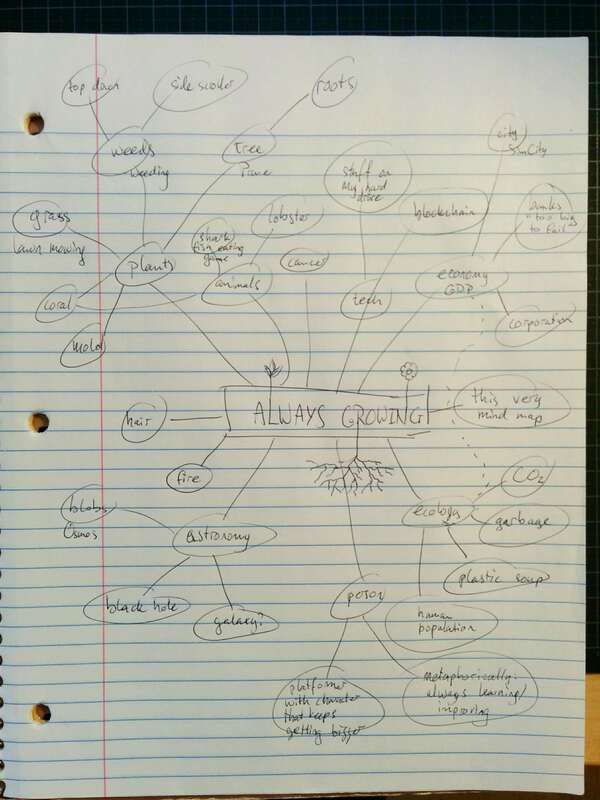 I don't always make a mind map, but when I do, I make it self-referential. I haven't decided, but am just posting this here in case anyone is stuck for ideas. I'm leaning towards something plant-based right now. Got the weekend schedule all cleared. Last time was my first game using Godot, and it was a good experience so I'll probably use Godot again. Other tooling: Inkscape? Gimp? Krita? jfxr? Audacity? Tiled? Whatever it takes, I suppose. That's "I'm in!" in Dutch, as I'm sure you all know. Can't break this Alakajam streak! I'm going to be using Godot 3 for the first time, because I want to see whether it would be suitable for larger (and possibly commercial) projects. I only did the Pong tutorial before, and made a bouncing Godot logo as a test project, but that's all, so I'll have to figure it out as I go along. On the other hand, I've done this sort of thing before: Morphing Maria was my first ever HaxeFlixel game, and that is still one of my best jam games ever. For graphics, I'll probably be using Krita with my Wacom tablet. I have done this once before, on Happy Chicken Farm, which turned out alright as well. If I decide for a more abstract art style, it'll be good old Inkscape. Pixel art would probably be Gimp, but I'm not hugely fond of either Gimp or pixel art. One idea I've been toying with is using real-life photos (taken during the weekend, of course), but I'll have to see if that would fit with whatever game I come up with. And then audio, my Achilles heel… I would really like to get away from the likes of sfxr (or my own spin-off, jfxr), but I don't have a proper microphone nor recording/foley skills, so we'll see how that goes. Maybe I'll do some "a capella" vocal sounds, as they usually end up somewhere between charming and hilarious – the entirety of that scale is good territory to be in. For music, if I feel inspired, I'll make a soundtrack in LMMS on day 1 already. I find that it's a good lithmus test: if I can stand listening to my own music for the entirety of day 2, it's probably not entirely awful. Anyway, time to tune into the announcement stream. Veel succes allemaal! The original idea was about mixing alloys, and I had chosen the punny name Alloy Vera for that reason. But as I ended up with all sorts of random liquids, whose names mostly end in -ium, I changed the name to the more appropriate, but probably less catchy Mixium instead. There are seven levels, and I found it difficult to create more: the more beakers you add, the easier the game tends to get, because there are n² potentially useful combinations in there. I have no idea whether the levels are too easy or too difficult. The last one gave me some pause, at least, but I promise that it's soluble—pardon, solvable.